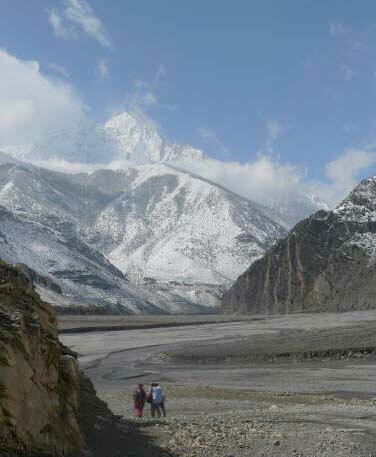 Last Trek Report – Kali Gandaki, March 2009 - Trekking in Nepal with Teresa, Slow Trekking for peoples of all ages. Kathmandu was ‘pollution central’ as I went to meet the mini-van in Thamel for the trip out to the airport. The van was late, as usual, but we eventually located each other via mobile phone with a little help from Netra. So, March 17, Sue and Jan (to be called Lou for the duration of the trek to avoid confusion) were on the Singapore flight which arrived early – a first. Then Jan, Ros and Hans arrived from Bangkok. They were all in good shape and 20 minutes later, somewhat culture-shocked, were all ensconced in the annexe at the Shambala Village Resort for a shower and feet-up. A couple of hours later we took a stroll up to the nearby Kopan Gomba. A full hall of monks were listening intently to the Rimpoche’s teaching in Tibetan. We strolled around the lovely garden and had a drink overlooking the, admittedly, smog-filled valley. We ate by candlelight (of necessity) at our hotel and toasted the start of our trek. Eric, my partner, was still with us for a couple of days and had spent the day taking Mangal to the German Embassy to suss out the possibilities of a work visa for Germany. Day 2: This is our Big Day Out in Thamel. We cashed our dollars, purchased some last-minute trekking gear in between Danish pastries and cappuccini at the Weizen, our usual base in town. 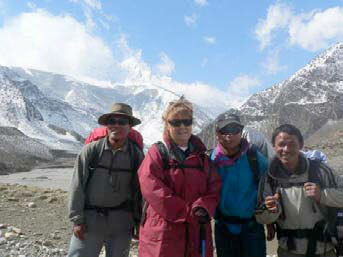 Ros’ group located their travel agent for Chitwan and booked a Mountain Flight to see Everest after the trek. Mangal took the group around town to the Assan Thole and Indra Chowk bazaars to see the traditional markets – so much more interesting than the backpacker’s ghetto of Thamel. Everyone returned with armloads of souvenirs (Amrita Craft). We had our traditional ‘farewell pizza dinner’ at the Roadhouse as we knew we wouldn’t all be together at the end of the trip. The Roadhouse feels as if you’ve wandered into Carlton in Melbourne by mistake. It rained that evening which was a huge relief as every leaf and windowsill in Kathmandu was heavy with dust. Day 3: We had packed by candlelight the night before, not the most effcient, and slept a little while waiting for the 4.45 alarm to go off. Our 6.30 bus arrived at 5.50 and it was hard to say goodbye to Eric as he headed off to the airport for a 9 am flight to Germany. Ramro sanga janus! (‘Travel well’ in Nepali). The bus to Pokhara went like a dream. Tea at the Hamlet, lunch at the Riverside Lodge… too easy. Student union elections were in dispute and the road had been blockaded by angry demonstrators. If one is to be delayed for an hour or so then the Riverside Lodge is not a bad location. Sitting on our rattan chairs with cool drinks to hand we read in the warm shade till the strike was resolved. Around 2 pm we were off but five minutes down the road was more trouble. While the blockade was offcially over it took nearly an hour to untangle the traffic jam. Tired and hungry we decamped at the Diamond Lake. A hot shower and one of Sanu’s famous daal bhats went down well. Day 4: The next morning wasn’t clear enough for a dawn boat ride so the group set off after a leisurely breakfast on the terrace. I got on with some work but began to get alarmed when the group was still not back at 2 pm. A strong wind had blown them off - course and a local guy had to come to their rescue, swimming out to paddle them around the fish farm. With the weather deteriorating rapidly it was a bit ‘hairy’ out there for a while. The ensuing storm was a cracker. We shopped for gear as lightning crackled overhead. When the storm finally broke there was debris flying everywhere. The umbrella I had just scored at the gear shop was handy but I thought I might do a ‘Mary Poppins’ at any moment. More candlelight packing (but perhaps the power was on and I was the only one who didn’t realise it) and an early night. ‘Airport at 5.15’ were the instructions. Day 5: We needn’t have hurried. On arrival at the Pokhara airport we had to rouse the security guards to open the gate. Our check-in counter was unmanned and Yeti Airlines had a solitary candle burning on the counter. Within ten minutes though, it all came together. Departure tax paid, bags weighed and securityinspected. The café owner from upstairs assured us the view was clear. We had half an hour to kill. He was right and we got our first proper look at the Annapurnas as the sun illuminated first one, then another of the peaks and bathed them all in a glowing pink light. We were so relaxed over our cuppa that we really had to hotfoot it when the call came. Running fulltilt along the edge of the tarmac we piled into our 16-seater Daunier and were quickly aloft . It was the best flight I’ve had in ages. Clear skies to see the peaks, smooth flying (not the usual lumpy air) and a flawless landing. It was much colder up at Jomsom where our porters were waiting to carry our bags over to the Marco Polo for a large porridge breakfast. Dorje and Bir had jeeped up via Beni to meet Purna, Khaji and Ramu. Lahar flew up with us. We were soon off down the road. It’s almost flat here with Nilgiri South right in front of you and in less than an hour we were sitting in Mangal’s mum and dad’s house sipping hot tea served by his beautiful sister Sumitra. An hour later we were in Marpha. Small Tibetanrun souvenir shops line the winding narrow lane through the middle of the village. The place is completely sheltered from the famous local winds. Jan succumbed to a pretty necklace and cotton scarves were bought to keep the dust out. There wasn’t much dust that afternoon because it soon started to rain. It rained and rained and rained. I discovered that my previously good waterproof over-pants were no longer so. It was bloody cold and wet. Ros, with an impending cold and a sore foot, opted for a lift on a motorbike. Pity we didn’t all do the same. Tired and wet we slumped into the old Tukuche Guesthouse with great relief – just a little pleased with ourselves for having ‘done it’. The hot table was alight and another brazier was soon set up to dry our clothes. 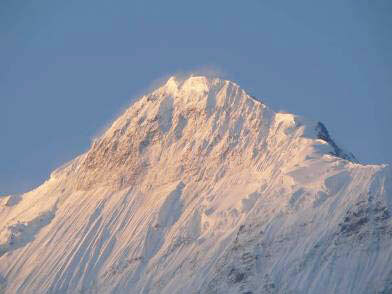 Members of the 2007 Annapurna Trek will well remember what this was like. We thawed out with the help of local rum and enjoyed the stewed apple with custard for desert. 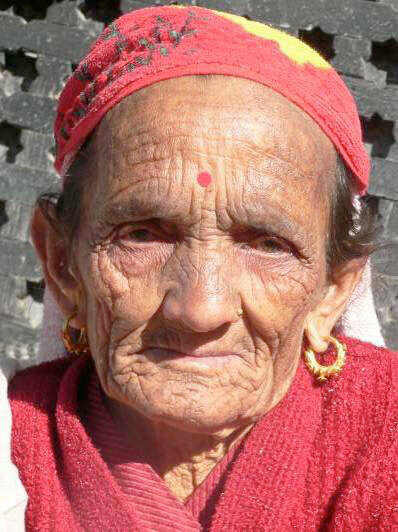 Day 6: On a bright sunny morning we le$ Ros at the jeep station for a lift back to Jomsom – she wasn’t feeling any better. The rest of us crossed the big new bridge north of Tukuche to the eastern bank of the Kali Gandaki river. This side is quite a different walk on a narrow trail which wanders through pines and junipers and apple orchards to the Tibetan refugee camp at Chairo. From here we crossed back on a rather wobbly old bridge just outside Marpha. We lunched as usual at the Paradise Lodge with its warm dining room and had a look around the large new gompa. A climb up there affords a great view of Marpha with its unique wind-proof layout and roof-top terraces instead of gardens. Mindful of the weather, which was spitting rain again, we hurried off to Jomsom. We just managed to stay ahead of the bad weather but the wind howled at our backs, pushing us along. This place is famous for it. They even write songs about it. Hot showers at the Marco Polo and feet up for some. Lou and I strolled around the shops and had a coffee at the Xanadu. It was a pretty quiet season so far. Nice for us but a bit disappointing for our Nepali friends. Day 7: Ros was no better and opted to fly back to Pokhara. She took Khaji with her and is possibly maxing out Hans’ credit card as I write this journal! (Actually, this turned out not to be true, sorry Ros). The rest of us, Hans, Sue, Jan, Lou and myself head off in perfect weather for the short trek to Kagbeni. This is really easy walking and the river bed is full of interesting rocks. It doesn’t take long to turn up some pieces of shaligram fossil. The wind was at our backs but quite gently at first. The twisted rock formations in this valley show all too clearly the violent prehistoric geology that formed the Himalayas. It was still tee-shirt weather when we reached the tea house at Eklai Bhatti but by the time we arrived in Kagbeni, forty minutes later, the wind was really pushing us along. Feeling a bit sluggish in the warm sun-room upstairs where we had lunch we decided on another short walk – into Upper Mustang. Until recently this ‘forbidden kingdom’ was off-limits unless you had a $700 ($US) permit. We only went an hour past the check-point to Thiri but it is an interesting walk. The little village of 80 people looks to be unchanged over the centuries with tiny donkeys and cows wandering in the village square. We were very welcome at Pema’s house for tea though Pema herself was not there. We later met her on the way back to Kagbeni. She had been for a two-hour walk to get a few groceries. Everyone in the group appeared to be acclimatising well so we organised horses all round for the next day. Day 8: We didn’t need such an early start as we were planning to overnight up at Muktinath. At 8 am our horses were saddled up and waiting patiently outside the lodge. The pony-wallah looked us up and down and allocated the horses according to size I think. The horses were fairly quiet and none wanted to do more than plod steadily – and who could blame them at this altitude. After morning tea (good to get off that horse!) we gave some of the porters a spell in the saddle but were glad to see the horses waiting for us a bit further on. Bir on a pony was a tragic sight. 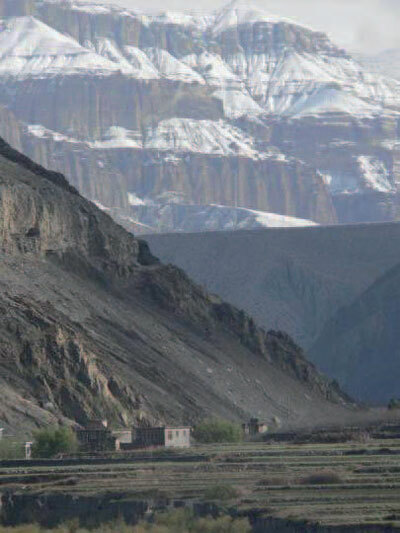 The day was gloriously clear due to the recent rain and so the views back down to Kagbeni and into Upper Mustang were superb. The higher reaches of the trail afforded spectacular views back to Dhaulagiri and Nilgiri. The recent rain had fallen as snow higher up and the peaks looked as if dusted with icing sugar. Magic! We got rooms at the Royal Mustang. While it is nothing special it is a lot better than the others we’ve tried over the years. 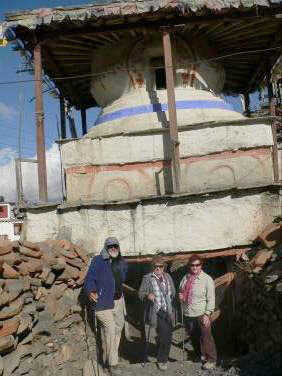 After lunch we all walked up to the holy temple at Muktinath. I always take enormous pleasure in this visit, as does most of our staff. The strange little gompa with its famous ‘fire and water’ flickering and gurgling under the alter is an intriguing place, cared for by nuns. 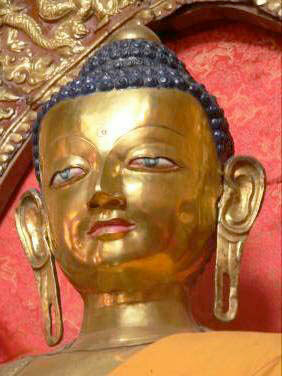 The Buddha statue here has a profoundly gentle aspect which I find touching. Spiritually renewed, we descended happily back to our digs in Rani Pawa. This group especially likes downhill – remind me not to take them to Everest. Oh, that’s right, Sue, you’ve already done it!! The hot table was a bit slow to fire up but, once it did, we persuaded Jan (not feeling crash hot) to bring her quilt with her into the dining room. Hans (feeling even worse) decided to skip dinner and stay in his cocoon of sleeping bags and blankets. Day 9: Next day broke exceptionally clear and Jan and Hans are feeling almost human again. The medication works. Descending makes everyone feel better too. The mountains sparkled and the whole group were in a happy mood. Trekking gently downhill on a lovely day, this scenery is achingly beautiful. Rugged yes but perhaps Australians in particular identify with this enormous sweep of ‘wide brown land’. We were in good spirits as we trooped back into the Asia Lodge. Hot showers (again, what kind of trekking is this??) and the last of our clean clothes. We got stuck into tomato and mushroom lasagne and a couple of Kukri Rum and colas later we were ready to party. There were 25 Nepali porters in the big kitchen/dining room, five of them girls from the Three Sisters trekking company which specialises in female porters for female customers. Dorje found a madal (drum) and, with the others all singing and clapping, there was soon very little space left on the dance-floor. Dancing with one Nepali who looked kind of familiar I soon discovered that it was Khaji’s younger brother. It was a cold night and I heard a bit of rain on the roof which didn’t bode well. Day 11: First flight, hopefully. Of course our flight was delayed. A rumour went around that our plane was coming all the way from Kathmandu. Our original 6.30 departure had been amended the previous evening to 8.30, but it was nearer 10 am when Man Kumar phoned to say he had just seen our plane take off and was still waiting patiently for us at the Pokhara Airport. Standing around in the brilliant morning sun (far too cold in the shade) with Nilgiri shining above us, it wasn’t too much trouble to wait though we regretted our ‘ultra-light’ breakfast somewhat. The flight took off to the north into a light breeze, made a huge banking turn half-way back up-river to Kagbeni, and gave us glorious views of the previous couple of day’s trekking, now defined on every ridge with fresh snow. It was one of the clearest flights I had ever seen. We could see way beyond Dhaulagiri and Damphus Peak on the starboard side. On the port side the Annapurnas were perfectly clear in every snowcapped detail. Pokhara was warm and sultry on arrival. Watching the It was great to be reunited with Ros, who had made a good recovery, and Khaji, who had been taking Ros sightseeing a little, as she gradually felt better. Having risen so early, unnecessarily as it turned out, we were only too happy to bail out early; sleeping with sheets and blankets instead of bloody sleeping bags! Luxury. Day 12: It just wasn’t clear enough today to warrant an early-morning trip up to the view point at Sarangkot so we took our time over breakfast and then made a long walk out along the lakeside. It was wonderfully warm but a good breeze picked up by lunchtime and kept the walk pleasant. After more serious shopping we visited Lahar at home with his wife Loyan and their kids Sopana (11), Sagar (8) and the adorable little Sunchok (4) who is already at pre-school. We just had time to visit Purna across the road where his wife showed us great hospitality in their tiny room which they share with two kids. We had dinner that night with the remaining boys, Khaji, Lahar, Purna and Ramu at the Moondance. The spinach lasagne was a winner and the white wine was an Australian chardonnay (not a good one but, hey, this is Nepal). We nipped across to the Boomerang for the cultural programme which had just started with singing and dancing from the many different cultures of Nepal. The performers got most of us up to dance with them for the final number, which had to re-start at one point due to a power cut – typical! Only Lou and I had enough energy left for the Busy Bee so we took Lahar for a beer. It was well-worth the effort as Vishnu, an amazingly talented local guitarist with his own unique style, was playing that night and a couple of Westerners put on a great blues number to finish of the night. Day 13: Our return bus trip was comparatively uneventful. Ros, Hans and Jan had left us for a trip to Chitwan National Park to see the rhinos, elephants and crocodiles and, if they are very lucky, a tiger. Lou and Sue enjoyed their front row seats. 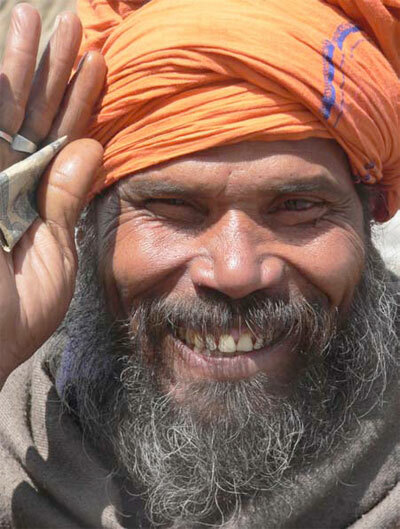 It’s a great way to see Nepal and joyfully effortless after trekking. 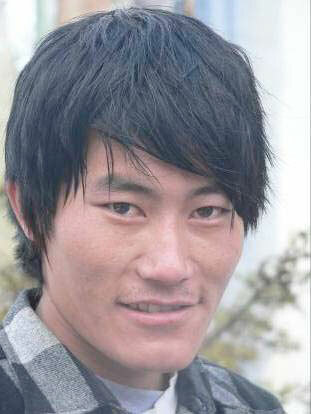 Dorje was a friendly face to greet us in Kathmandu and we were soon under hot showers at the Shambala. Suitably spruced-up we walked into Boda. 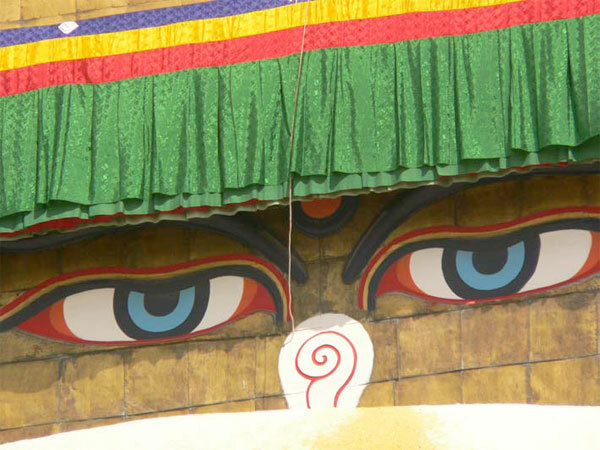 This deeply spiritual place never fails to touch people, especially if one can visit around dusk when the local Tibetan population are out in their hundreds doing their ‘kora’ (circulating around the great stupa) while chanting the ancient mantra ‘Om Mani Padme Hum’ or ‘Hail to the Jewel in the Lotus’ (the Buddha). We got the front table at Flavours in order to watch the people going around the stupa and the sound and light show put on my Mother Nature’s impending thunderstorm was awesome. Power failed, the candles blew out so in the dark we sipped our wine and watched as flashes of lightning illuminated those famous ‘all-seeing eyes’ of the Buddha. Wonderful. Day 14: After a morning visit to Swayambu, the socalled ‘monkey-temple’ we hit the shopping area of Thamel once again. We were in the old tourist region of Durbar Marg when a thunderstorm hit at almost exactly the same time as the day before. It was easier to retire to the Namlo Restaurant than battle the rain and peak-hour traffic in a taxi. Now that the group was reduced to me and two enthusiastic clients, transport was much easier. We all fitted into one taxi. Well into our cups we hailed a taxi with flashing lights, dubbed it the ‘disco taxi’ and had a pretty lively trip home. There is now at least one Kathmandu cabbie who knows that Australians are good fun. Waiting for a jeep in Jomsom? Should have gone Trekking with Teresa! Day 15: But wait, there’s more… Rounding up my friend Julie once more we taxied up to Nagarkot. Dorje took us to a fabulous big resort hotel for a coffee. Given the impending monsoon build-up we felt pretty lucky to get a great view of the Himalayan range, Ganesh Himal being the nearest. We walked down to Changu Narayan, descending through farms and villages, seeing lots of baby goats, chicks and puppies. It is Spring after all. Over a long sunny ridge of pines then a few scattered rhododendrons it was 3pm by the time we sat (slumped) for lunch. Changu Narayan is the oldest temple in the Kathmandu Valley, founded in the 4th Century. Exquisite lattice work on the windows and carved wooden supports on the pagoda roofs. The rain came bucketing down as we sat in the local bus waiting to go down to Bhaktapur, rendering a visit to that lovely old city a bit pointless – something to do next time? Dinner by candlelight at the Shambala. Not enough light to pack so we got a bottle of wine instead. Day 16: Our last day together was a bit sad. A teary farewell to Lou; we had become good mates on our little expedition in the mountains. I am sure Lou will come back to Nepal. Sue was only moving up to the Benchen Monastery so I would be seeing her again in a few days. As I finish this diary, having had a lovely day off, lying on the bed half the day, nibbling Swiss chocolate, I marvel a bit at all the wonderful people I get to meet in this job. First arrivals for Everest tomorrow, wonder what they will be like…??? PS: Though we left Ros, Hans and Jan at Pokhara, I’ve since heard that they had a great time in the jungles of Chitwan and their Big Day Out with Dorje today was a success. Cheers folks. T.